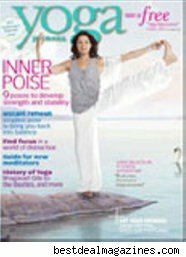 Get a one-year subscription to Yoga Journal (9 issues) for just $4.39 through Best Deal Magazines. This is the site's deal of the day, so it expires tonight (9/27/2010) at midnight EST. The cover price is $21.95 -- that's an 80% discount. You'll need to sign in or create an account at Best Deals to complete the purchase. I've never subscribed to Yoga Journal, but Best Deals says each issue has tips on health, nutrition, personal growth, fitness and inner peace. Plus, yoga tips for beginners, intermediate, or advanced students. I'm really tempted to subscribe! Taking advantage of this deal supports WalletPop. Thanks, Coupon Cravings!